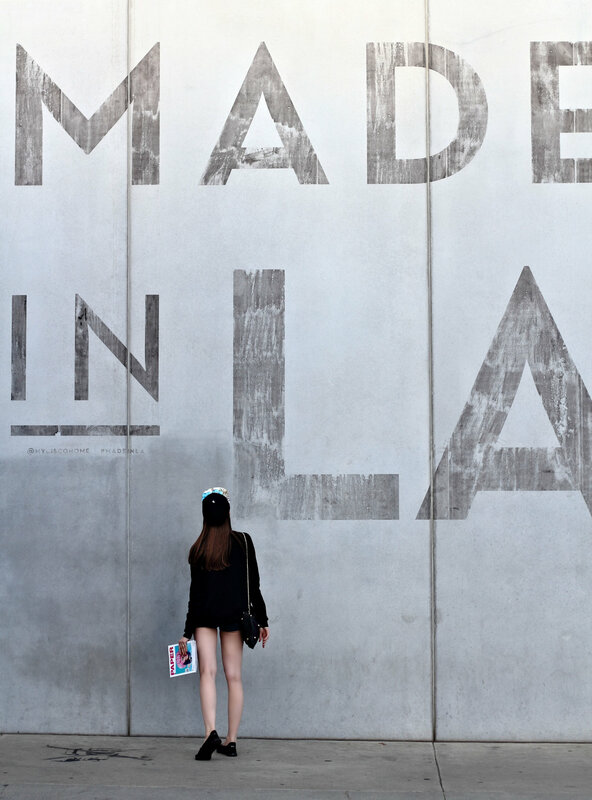 There are a few spots in Los Angeles, which you just need to visit. You can find there a lot of inspirations and fun at the same time. “Pink Wall” is the most interesting and sweetest photo location in Los Angeles. This creative facade belongs to the Paul Smith store in West Hollywood. In L.A., I could experience how beautiful and colorful streets can be for the fist time in my whole life. Street-arts can be found everywhere: on buildings, on sidewalks. The spirit of the creativity can be felt in the air. I really admire all artists and creative people in this world. Będąc w Los Angeles nie możecie przegapić popularnej ulicy – Melrose Avenue (Hollywood). Występuje przy niej wiele ciekawych i artystycznych miejsc, do których między innymi możemy zaliczyć “Pink Wall”. “Pink Wall” jest własnością sklepu Paul Smith. Spacerując ul. Melrose Avenue, możecie znaleźć dużo inspiracji i z uśmiechem na twarzy zaobserwować rozmaite przejawy sztuki, istniejącej na ścianach budynków bądź na chodnikach. Kreatywność unosi się wręcz w powietrzu. Podziwiam i doceniam twórczość artystyczną wielu utalentowanych ludzi z całego świata i trzymam za nich kciuki! A little sneak peek of what’s coming up tomorrow! That pink wall is lovely! This wall is such a great color! What a cool find. Plus, I love your outfit! So cute! I love that pink wall and your hat! What a great photo backdrop! I love that pink wall! What a cute post! Loving that pink wall! Such a perfect backdrop! The contrast of the black works perfectly with it! Love that pink wall, I wonder if my husband would let me paint a section of our walls pink…. Such a cute outfit and I love the pink background! Love the outfit and background! I’ll definitely have to make a trek to melrose and check it out. That pink wall is so vibrant and radiates energy. I love your pictures in front of it! That wall makes for some great photos. I love the outfit. Your shoes are awesome! I love your outfit; I also love how you just pop in front of that pink wall! I like how creatively you put ths image together. And you look terrific, too! The pictures of you at the pool are stunning and I love all the pink walls. How long are you there for? What a great pink wall! I love looking up walls in places I visit. they make such great backdrops. You look great! This backdrop is gorgeous! The pink is my favorite of all it makes the photo. Not to mention those jean shorts are fab! How adorable! I’d spend an hour in front of that wall going IG crazy! I wish we had a fun wall like that here for me to take pics in front of! I love this link wall. It is my daughters favorite shade of pink. I have spent very little time in LA (just part of a day while waiting to get on a cruise ship) – not enough to get much of an impression. Your photos and comments make me want to spend some more time there! Hope I’ll be able to go to Los Angeles in the future, there are so many things I have missed in my previous trips. Love a fun photo wall!